Early on the morning of February 8, 2019, God sent his angels to reclaim to himself, his sweet, loving child, Geneva Kinnie Smith, Geneva was the youngest of seven children of Thomas and Kinnie Goode. She was born on June 14, 1914 in Dinwiddie County, Virginia. The last born to her earthly parents and the one living longest, she now completes her family circle in Heaven with their Heavenly Father. Geneva was raised in a Christian home and for her entire life has served in churches in Virginia and now in Baltimore. While in Virginia her family attended Sunday School and church services regularly. She and her brothers and sisters were in a singing group where they sang in their church and other churches in the county where they lived. Geneva joined Faith Baptist Church over 75 years ago and remained a faithful member until health prevented her from coming out. 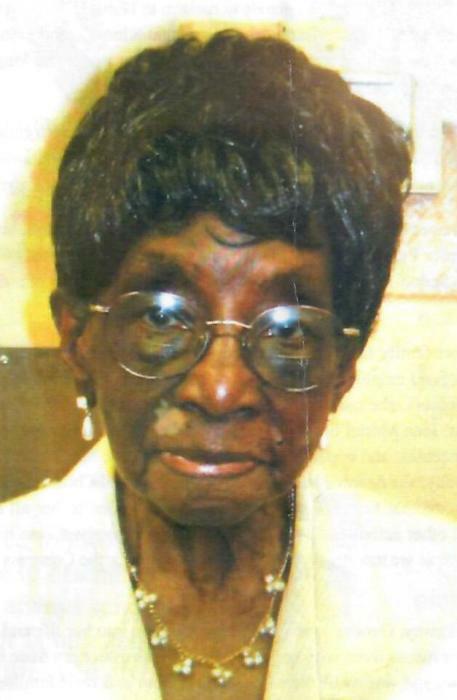 She served on the former Pastor's Aide Society, Sanctuary Choir, Women's Chorus and Golden Age Ministry. She also attended Sunday School. She loved the Lord and would speak words of praise as testimony to how much God meant to her. Shortly after arriving in Baltimore, she met Joseph Smith and they were later joined in holy matrimony. From this union their only child was born, Jean Muriel Smith. Joseph passed away in June 1987. Jean was the love of her life and just as she kept herself immaculate and beautifully dressed, so was Jean. When several of her siblings passed away, Geneva took their young children into her life and home and continued to raised them as her own. Several of her nieces lived with her when they attended Morgan State University. Geneva was very kind to her nieces and nephews and was available to encourage them and their families on special occasions. Theirs was a mutual love which remains even now. She loved the Lord and was faithful in reading her Bible and especially loved Psalms 100 and 121. A woman of prayer and faith, she was great in fulfilling her duties as a wife and mother to her darling daughter, Jean. She lived in the Waters Towers Senior Housing Facility on her own, and at the age of 100 years, Jean felt it best for her to move with her and her husband Norman (now deceased). While living at Waters Towers she worked in the kitchen assisting with their food program. Geneva leaves to cherish her memories: her loving and devoted daughter, Jean; nieces, Gloria Douglas, Betty Austin, Mattie Ruth Cromwell, Jean Green (Freeman), Diane Scott, nephew, William Parham Jr.; her extended family; the Garcias, Altstons, Israels, Greens and Rogers; her special caregivers, Keisha Scott, William Parham and Esmeralda Coral; a devoted friend, Georgia Parker (Prospect, Texas) two Goddaughters Mary Thomas and Shabrea L. Taylor and a host of family and friends.